AirSelfie, the first pocket-sized flying camera that integrates with smartphones, is now available to pre-order in the UK following a successful Kickstarter campaign that drew backers from all over the world. The stylish drone allows users to capture the perfect selfie from angles never before possible and is set to raise the selfie game nationwide in 2017. Selfie-lovers can pre-order AirSelfie on the official website: www.airselfiecamera.com. There are two available package: AirSelfie + phone cover (£220) or AirSelfie and powerbank (£229). 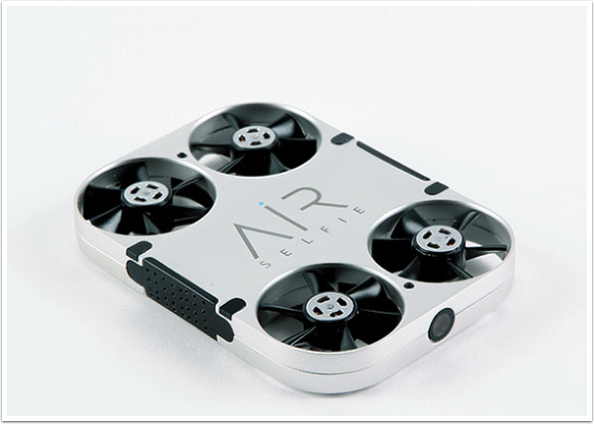 Comprised of four powerful propellers and a 5-megapixel video camera, AirSelfie is smaller than a smartphone and can fly vertically up to 66 feet, allowing users to take aerial selfies of themselves and their friends. The device connects to the most popular smartphones, including iPhone (6, 6s, 7 and 7 Plus), Google Pixel and Samsung Galaxy S7 Edge. The device includes self-generated WiFi and comes equipped with a rechargeable battery through a cell phone case, as well as the option to purchase an external power bank. Additionally, a vibration-absorber system and in-flight stability systems guarantee stable, clear, flowing images.